VpCI-812 Wax/Paste is a long-lasting, high-shine wax and rust blocker containing high performance Vapor phase Corrosion Inhibitors (VpCI). VpCI-812 Wax/Paste stops corrosion, ultraviolet (UV) rays, and fiberglass oxidation that silently attacks the finish of vehicles beneath the shine. VpCI-812 Wax/Paste adds years to the finish of a vehicle or boat. VpCI-812 Wax/Paste works on any waxable surface, removing dulling film and oxidation. 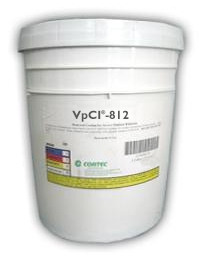 VpCI-812 Wax/Paste uses the same tough, long-lasting wax used by professionals. Apply VpCI-812 Wax/Paste to painted metal surfaces. After the paste dries, buff it off with clean cloth. VpCI-812 Wax/Paste can be applied by hand or with a high speed buffer using straight strokes. Do not use excessive pressure. Available in 5 gallon plastic pails (Cortec Product # 12500618) or 55 gallon metal drums (Cortec Product # 12500619). 5 gallon drum weighs 50 pounds and ships under our standard shipping rates. The 55 gallon drum must be shipped by truck. We will provide you with a freight quote before we ship this product. Do not allow product to freeze.